I have so many things to tell, so many things to show. I'm very very very nervous at the moment but will tell more about that at the end of the post . I first wanne begin with a birthday. I didn't made very good pic's, it was dark that day! But maybe she will show better ones on her blog. The theme of her party is pink with grey, and her favo color is purle. So after looking around on her pinterest ,in my stash pattern, this is what I all made! I really hope she is very happy with it. I'm still loving this piece!!! Two weeks ago we had a townsday, many organisations in town signed it, and they made a few competitions, one on them was a baking competition. I asked the kids and they loved it! So we started baking, both there own cake. You see them both working hard??? Few things I show here in the above collage. At my physiotherapist ( she is on the pic) they needed do a parcour. In the gym they could join for Tennis or Judo. In a Atelier they could help paint. Everywhere they could collect stamps. At the end of the day, we needed to give the paper with the stamps, and wait in the townshouse who won the competitions. We had a awesome day, and they had so much fun, that was important. After a few day's I heard that Noah's cake had 1 point lesser then the winner!! All the kids loved his blue cake. YEAH, YEAH,, ♥ ♥ Very good Noah!! Then I was called if we where home in the evening, because they had something for Noah, and they wanted to give it before the newspaper came. So I presume he had won something. And YES he had won the stamp collect competition, and they told that would be in the newspaper, the winner of that, because they needed to time to see all papers! Can you imagine how a little boy felt when he was the winner of the whole town and his name was also in the newspaper!!! For the baking contest I already made him a diploma myself because that was so good of him..
As Noah liked the Judo on that day, we have asked him if he liked to do that some more.. Here you can see him with his girlfriend who also liked it very much. He is having so much fun on it! We call it Zeeslag, I thought in English Sea-Battle or just Battle.. Kids are loving it here!! Then the thing I'm nervous about.. In a few hours I have my very first competition in running. I'm doing a ladysrun of 5 km. I'm typing here very nervous. The weather is not working with me, it's raning and a very hard wind. But I love doing it!! I my next post you will hear all about it! And see the Easter crafts I made. Have a great Sunday all, hoping you have better weather. Good luck with your run. I hope the weather isn't too bad. Congratulations to Noah, it sounds like you all had a great day. Goodluck😊👍! Hope the weather cooperates and dry during your run. And good luck for your run !! Noah is turning into a real Renaissance man! 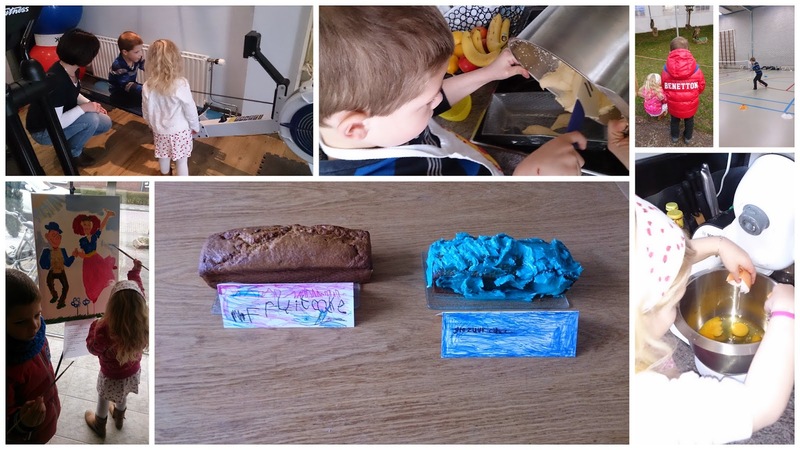 Baking, stamp collecting, martial arts.. what's next? 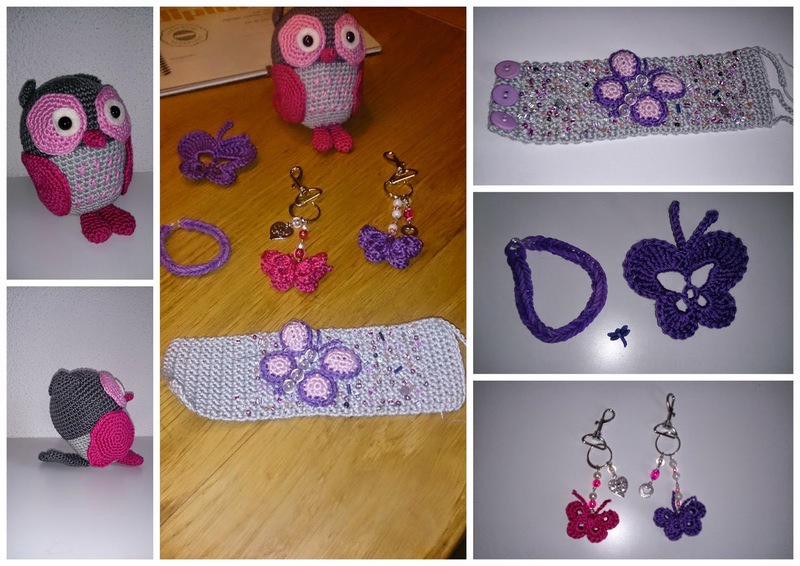 Lovely set of gifts for your friend. I really like thst Soda Stitch piece. It's coming along nicely. Je borduurwerk is erg mooi. Leuk met zn allen cake bakken. Heel gaaf zo'n blauwe cake. En leuk dat Noah gewonnen heeft. Je heb weer een leuke week gehad. Veel succes met rennen. Its sooo nice to see some cross stitching! You are one busy mom, Annette!! I always love stopping in to see what the kids have been up to. 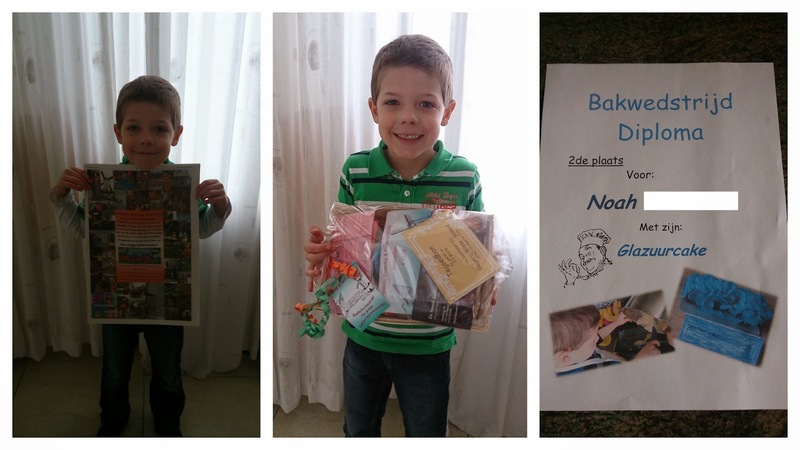 Congratulations to Noah on his yummy cake and stamp collecting win :) He looks so proud in his photo. Happy Easter to you and your family, my friend! Wow, zulke mooie kadootjes voor Val!!! Ze moet superblij zijn geweest!Die uil en vlinders...echt geweldig!Zag dat je goed gelopen had.Knap hoor! En je borduurwerk schiet lekker op, veel borduurplezier!